Lk. 1:26-38 The angel Gabriel appears to Mary at Nazareth in c.6BC (see Map 4). Mary is engaged to Joseph, but their marriage has not yet taken place. The angel announces that she will shortly become pregnant by the power of the Holy Spirit and will give birth to a son whom she is to call ‘Jesus’ (Jesus is the Greek version of the Hebrew ‘Yeshua’ or ‘Joshua’ meaning ‘God saves’). Matthew’s gospel explains, “you will name him Jesus, because he will save his people from their sins” (Matthew 1:21). The angel reveals that Mary’s son will become a king like his ancestor King David, and will rule forever (see Luke 1:32-33, 2 Samuel 7:12 and the feature on Who was the Messiah? in Section 2). Nazareth, where Mary lived, was a small village in the hills of Galilee just 4 miles / 6 km south of the city of Sepphoris (see Map 4). It was a hilltop settlement looking south across the Plain of Jezreel (also called the Plain of Esdraelon). It was close to the trade routes along the Jezreel Valley and up through the hills to the Sea of Galilee. Its name means a ‘watch-tower’ in Aramaic – a good description of its location. 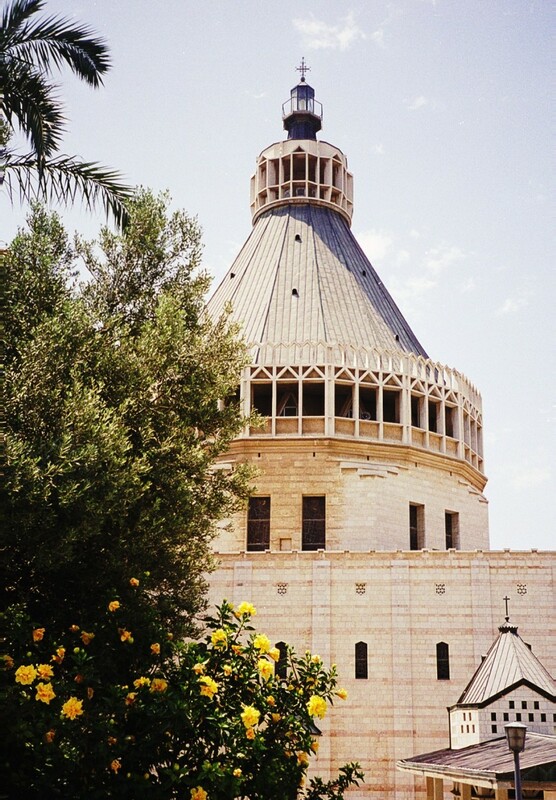 Today, visitors to Nazareth can enter the huge Basilica of the Annunciation, built in 1966 over the remains of earlier Byzantine and Crusader churches, and above a cave believed to have formed part of Mary’s home. Behind the church, other caves dating from the time of Jesus were adapted to form houses. A Latin text inscribed in the stonework above the entrance to the church declares, ‘The Word became flesh and dwelt among us’ (see John 1:14). The porticoes in the courtyards surrounding the church contain striking images of the Virgin Mary from many different countries around the world. The nearby Church of St Gabriel contains an ancient well where some believe the angel Gabriel appeared to Mary, while further up the hill, the Church of St Joseph, built in 1914, is believed to house the excavated remains of Joseph’s workshop. About 500 yards / 500 metres to the south west of the centre of Nazareth, on a sunny south-facing hillside, is Nazareth Historical Village. This modern reconstruction of a village from Jesus’s day is built around the archaeological excavations of a 1st century vineyard, including vine terraces, three watchtowers, a winepress and an irrigation system. Visitors are given a guided tour of the working farm and the reconstructed village and synagogue. More energetic individuals can walk the ‘Jesus Trail’ linking Nazareth with Sepphoris, and on to Capernaum.